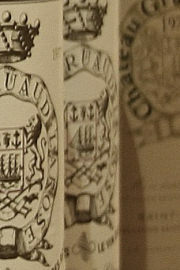 The prestigious Bordeaux property of Gruaud-Larose, a 2nd growth in the 1865 classification, lies in the commune of Saint-Julien, a single vineyard of 80 hectares composed of gravels from the Gironde estuary. The poor soils provide excellent drainage, especially as the vineyards are on the highest plateau of Saint-Julien – though that is a mere 18 metres above sea level. Gruaud was one of the first Bordeaux estates to abandon synthetic pesticides and herbicides in the vineyard during the late nineties, turning to mechanical and organic solutions to protect and nourish the vines. Though not biodynamic, they do employ natural homeopathic treatments such as organic compost made from seaweed to protect against mildew and rot. The vineyard is composed of 57% Cabernet Sauvignon, 30% Merlot, 8% Cabernet Franc, 3% Petit Verdot and 2% Malbec. This tasting of six vintages spanning 2005 – 1962 took place in the offices of fine wine broker Fine+Rare Wines. Prices available at time of writing, in-bond and ex-VAT. Fabulous, enticing nose with such a dark-hued pool of bramble and black plum, with some herbal and olive edges and a lovely sense of depth and intensity. The palate is tight and youthful of course, the oak adding a creaminess and the tannins steely. Beneath there is a fine quality and depth to the fruit, this has energy and vitality, with a real juiciness in the finish. A wine with real potential to score higher than its current 93/100. £48.00. Fresh, vital, very youthful nose with spice-flecked deep black fruits. There is a meaty, earthy depth to this, with that animal, quite sauvage note beneath the plush fruit and spice. The palate is in a fairly tough grip of the structure at this stage, with plentry of tight, sinewy tannin and an orangy grip to the acidity. The finish shows that this has harmony and all the components to age very gracefully. One to revisit in a few years. 93/100. £62.00. What a gorgeous nose, with abundant sweet fruit and muscular concentration, but nowhere near as unyielding as the 1986, with softening hints of earth and truffle, a light smokiness wreathed through the fruit. Delicious palate, this has energy and a real edge of acidity and tight-grained tannin. The Finish is really, really long, with spices and plenty of cedary finesse, but a depth of structure supporting plenty of fruit. Harmonious and very complete, a fabulous Gruaud. 95/100. £121.00. Quite tight, quite reluctant on the nose, the mineral and earthy character and touch of tough, sinewy leather and cedar and a little beefy black fruit coming through. The palate has a wonderful smoothness and richness, with real concentration and a firm, supple but fairly unyielding charcter. The fruit is all there though; this is such a typical 1986 in many ways, with that massive spine of structure, but gradually, very gradually, shedding enough of that to let the obvious fruit emerge. 93/100, but if the fruit lasts, the potential for higher. £127.00. Slightly more brackeny and leafy, with charcoal and has a gamy edge. The palate has a deep, concentrated character, though the fruit is now a little subdued; there is sweetness, a fine sweet earthy sweetness, with hints of fudge and more truffle notes, and a very firm core of acid and spicy tannin. A lovely wine that needs some sympathetic food to set against slightly less out-going fruit. 91/100. £93.00. Still a healthy ruby at the core, brick on the rim. Gorgeous nose, the faintly sous-bois and game notes set against some green, leafy pepper and still hinting at rich bramble fruit. The palate retains beautiful sweetness; it is more than the fleeting glimpse of decaying sweetness of some old wines, this has some juiciness and vitality at its core. There’s coffee and a lovely chocolaty slick of sweetness, and the very fine, chocolaty tannins and acidity are still framing this wine beautifully. A gorgeous 1962, with huge length, pure, with spices and roasted red fruits and an edge of earthy minerality into the finish. 94/100. Around £1,500. See all stockists on wine-searcher.com.